MWN Blog: So what's the weather going to do this weekend in the Mid-South? So what's the weather going to do this weekend in the Mid-South? Earlier in the week, in a post about the weather pattern for the first week of spring, I talked about what could only be described at that time as a "murky situation" in the extended forecast. It's 3 days later and I am realizing more why it was murky... because it is. Friday through Tuesday will not be one of those easy to predict "cold front...high pressure...cold front" types of patterns. Models are beginning to zero in on the framework of the upcoming pattern, even if the details leave a bit to be desired. Here's the framework: a cold front moves through today and sinks south to the Gulf Coast. That will bring an end to our mid-May weather of the past several days. I don't see us threatening 80 degrees or any records again after today for some time (remember, the normals for this time of year are highs of 65 and lows of 45). Most all of the precip associated with this front will be well to our northeast, so I went with a 20% chance today. Much cooler weather (i.e., 20 degrees cooler) will filter in behind the front so look for highs in the 50s tomorrow as the next system organizes over the southern Rockies. By Friday, clouds increase as the cold front makes a return north as a warm front. As the front meanders around in the Mid-South Saturday and low pressure moves across the region along the front, we will see increased rain chances and possibly a few thunderstorms, though I don't see anything to point to severe weather right now. As the warm front gets to our north, we'll probably see 70 degrees again Saturday. Behind the low, clouds will still linger on Sunday and, with a slightly-modified airmass, it will be a touch cooler with slight chances of rain. By Monday and Tuesday, another low pressure forms over the southern Plains and moves east towards the region. The track of the low through the lower Mississippi River Valley is one of those "sketchy details", but no matter where it eventually ends up, our rain chances will be higher again early next week. The track of the low will determine our thunder chances, as well as any severe risk from this system. Right now, I would say it is minimal, but we'll have to continue to monitor. 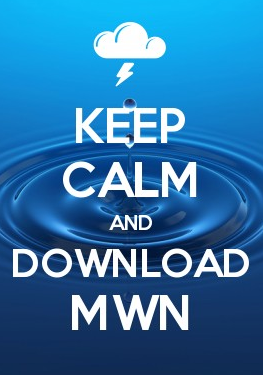 It's one of the things we do pretty well here at MWN - that and keeping you updated. We'll continue to do both! Here's the complete forecast. NOTE: We're having some difficulties with StormView Radar today. While we work on that, you can use our alternate radar to keep tabs on any rain that forms. MWN Storm Center - with radar, severe weather warning map, safety tips, and more!